So today I watched a video clip of an irate parent who went to the news because a teacher at an elementary school "jumped on the hood of her car". I was curious so I watched. What I quickly realized is how the story was incredibly one sided and highly annoying as the teacher was berated for attempting to stop a parent who refused to follow school safety rules. In this video Hal Boman ( Teach Like a Rockstar) gave an amazing commentary about the teacher in the video and gave insight into what is really like for teachers and administrators when it comes to the safety of the students we serve, by doing whatever it takes to get the job done. Adults need to set good examples for their children and stop thinking that rules don't apply to them. If parents want to make their own rules for school then by all means opt for Home School. Second has anyone stopped to realize that educators are not trained security officers? When you see us standing in the middle of the street directing traffic for hundreds of parents to pick up and drop of their children in a SAFE and ORDERLY fashion it's done while putting our lives at risk with limited resources. In my past experience I had to get funds donated just to purchase safety cones and reflective vests for staff to add an additional layer of support. Third We have to change the narrative about happens in our schools. Instead of the teacher Mr. Aaron Morgan being praised for being a leader and protecting children's safety by any means necessary we allow a parent to get valuable airtime to bad mouth yet another teacher. I wanted to hear the news broadcaster ask questions to have Rita take responsibly of her actions, but sadly that didn't happen. Rita was trespassing , driving the wrong way, and refusing to follow directions UNACCEPTABLE- howboutdat??!!!! Educators need to stand up and start demanding that our schools be deemed a safe place for students to learn and adults to work. Continue doing whatever it takes to change the narrative of what happens in schools and what real leaders do every day! Whatever it takes! Even if it means that we jump on the hood of a car of parent who is putting the lives of children in danger in the car riding zone! Click here to support this teacher Aaron Morgan for holding adults accountable by signing this petition. Teacher appreciation week is one of my favorite times of the year. As a former principal I looked forward to surprising my staff and showing them appreciation. I believe in going all out for people when showing appreciation and it was no different as a principal. Educators can often feel overwhelmed with their constantly changing busy schedules, grading papers, lesson plans, and classroom management among other daily activities. So teacher appreciation is just one of many times of the year that teachers and staff can feel special. I would have my plan already in place during the start of the school year. Normally there would be a theme that was closely connected to the school wide theme for the year. My plan was pretty simple- Food, Gifts and Activities. My staff loved to eat (so did their leader LOL) so it was a no brainier that there would be days centered on food. The week normally started off small with a treat bag or something in the snack realm then lead up to a big luncheon style fest. One year for the school theme: Building on our Success, each day had a “Build your Own” food theme. Build your own yogurt parfait, Build your own Sundae, Build your own waffle station, and lastly a cookout with a Build your own hamburger station. You must enjoy working with adults in the same manner as you enjoy working with students. Ever met a teacher who didn’t like children and wondered why they went into education in the first place? Those are the same thoughts I have when I talk to principals who don’t like working with adults. Ummu hello that’s a large part of your job. When you recognize staff members year long and are genuine in your appreciation it becomes a part of your school culture. I would do random interruptions with a snack cart, or stickers and even raffles for free 100 colored copies. The crowd favorite were the quick handwritten notes that I left in classrooms on sticky notes. It was a quick way to recognize the work that they were doing- they loved it. No one really wants a gift from someone who has been unpleasant towards them year round or has not built a relationship with them. In addition, as a leader if you haven’t built genuine positive relationships with your staff you won’t feel a desire to honor and appreciate staff. Remember that rewarding teacher actions can go a long way. Treating the teachers with respect and gratitude will result in happy and motivated teachers. With a happy and motivated staff, there will be a good working environment which will result to teachers who strive to do a good job. It also promotes a sense of belonging causing the teachers to desire to make the school a better place. 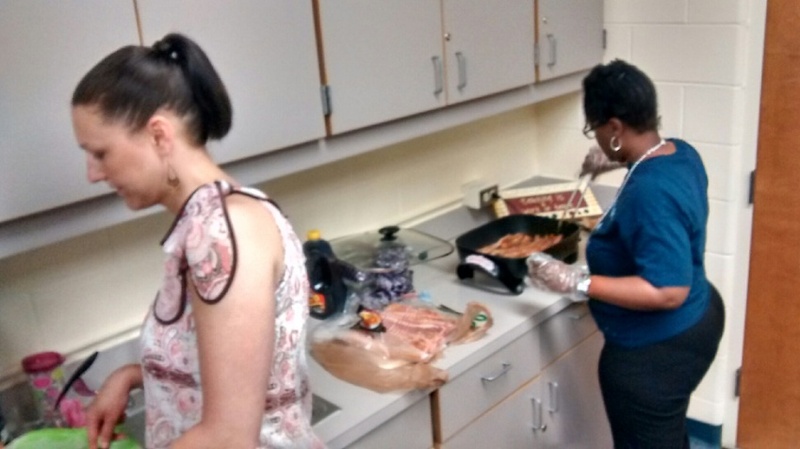 That's me frying bacon for the the staff! I am KRiley also known as the #principalnerd. I am passionate about education and helping others I am a coach at heart. There are so many people who are working with students daily and they need help being successful and I want this platform to be the place for that. Are you are an educational leader looking for resources and and support? Then you have found the right place. Look for regular posts that are designed to be real, honest and helpful. Lets change the face of educational leadership for the better by growing better leaders!